Big Animals Expeditions provides intimate encounters with these incredibly beautiful and gentle giants. 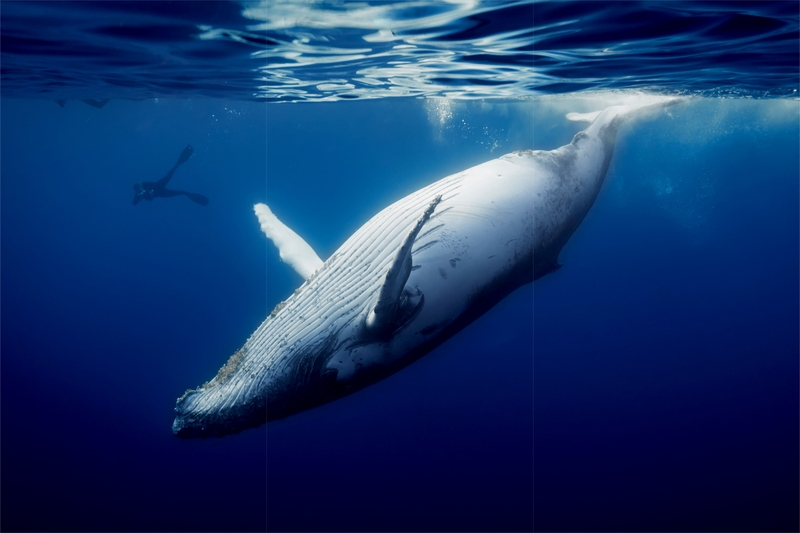 In the warm blue waters off the southern tip of Sri Lanka where the visibility is an astonishing 100 feet of marine paradise with ocean temps well into the 80s, we will have the privilege of interacting with these magnificent whales in a way few humans will ever truly understand. Their commanding presence in the water is undeniable and overwhelming, and through this Big Animals experience, you will become one of a select group of people lucky enough to share the sea with these amazing animals in such intimate quarters. Every effort is made not to disturb the whales. This is achieved by limiting our team only to four guests and when encounter time arrives we send only two people into the water to view the incoming whale. Day 1: Arrive in Colombo: transfer to for overnight stay at colonial time architecture Galle Face hotel. Day 2: Depart the following morning by private coach to beach front Mosvold Villas in Weligama. Days 3- 8: Six days eight-hour days of searching for blue and sperm whales. Both lunch and water will be served on board. Bring maximum sun protection, long sleeved shirts, hats, and sunglasses for daily long distance cruising. Sea conditions are mostly calm to moderate, with rising winds in the afternoon. Day 9: We pack up for our return to Colombo in time for an early evening visit to the Galle Face hotel. Sri Lanka’s iconic historic waterfront hotel built in 1864, located in the heart of Colombo. We provide you airport transfer according to your flight - majority of international flights depart late at night or in the early hours of the morning, just after midnight.